The presents have been opened, the toys are being played with - everyone is happy and relaxed. Xmas lunch is in the oven, and the Pavlova and fruit salad is waiting for afters. It's not hot - but it's not cold... I think this one is going to be another successful Kiwi Xmas. I thought you might enjoy this link to a little you-tube clip portraying the Nativity story... as told by children from St Paul's Church here in New Zealand. I've been playing with different design ideas for the two cot quilts that I have been asked to make. It is a hard task to make quilts for prospective parents, when you don't really know them, so decided to stick with simple and modern. I bought a charm pack of Hubba Hubba by Me and My Sister Designs - randomly thinking that it would be a good range for a kids quilt. I pulled out the three black designs, because they just didn't work for this purpose, and separated out the more boyish looking designs (blue, green and aqua geometrics) from the more girly pinks, purples and florals. OK, what to do with them? I've had a chevron design kicking around in my head since making my Hometown Wagon Wheels back. And where I realise that I don't think I actually have a photo of the back of this quilt completely finished, but here is a progress shot - and I added a cream strip to the cream side, and a grey strip to the grey side, making it look like a patterned chevron between two different coloured solids. Right, back to the baby quilt. and it was all going well until I tried to figure out how much fabric I would need for the side panels and realised that it wasn't very economic use of fabric... because my measurements had exceeded the width of fabric. Poo. It took a while but I figured that by rotating the chevron stripe so it ran side to side meant that the top and bottom strips could once again be cut from a single width of fabric, and I'd only need 10 charm squares - back on track again. A bit of a mock up on the design wall... finished size 40 x 48". I went for a green mottle and a navy dot. Practical and blokey... although my hubby is not keen, and thinks there is too much dark blue. I needed 1 x 28.5" strip of navy (trimmed to 40.5" wide), and 1 x 5" strip for the navy triangle units. From the green I needed 1 x 12.5" strip (trimmed to 40.5" wide), and 1 x 5" strip for the green triangle units. Simple, go on... I know you have some leftover charm squares just itching to be used! From my charm pack I had 32 charms left to create something magic for the girl quilt. I had heaps of ideas, but in the end went with something very simple, and ordered another matching charm pack because of course, that one charm pack was never going to be enough. I'm just making triangles and scattering the designs and colours across a 9 x 11 simple grid. It will have all the spaces filled in with triangles (although I did think about making an asymmetrical arrangement but wasn't happy with how it started to look). I hope to frame this with a plain 2" border, making it finished size 40 x 48". Perfect. I am all ready for Xmas this year... so no wrapping gifts on Xmas Eve like usual. I hope you all have a wonderful time with family and friends... and receive something nice under the tree. Merry Xmas! Is it too early for a roundup post of 2014? I remember starting this year feeling a bit low about quilting in general... remember the Fabric and Project Diet? - and the angst of how I was going to cope, but prepared to just manage and do my best. This year turned into the year of doing things for others... quilts made for school fundraising, gifts for parents, a magazine submission that needed to be finished to a deadline, and a commissioned baby quilt, plus the quilting for Imogen's quilt that I've had for months and for a variety of reasons have only just started. I tried to remain focused on just a few WIP's and have made terrific progress. I also feel I have curbed my compulsive fabric buying tendencies... no, I'm not a saint and am not totally reformed. I've bought things I've loved, but I've also not bought things that I've loved. It is progress. Last week disappeared in a blast of school activities. Dylan had his Year 6 graduation dinner as they celebrated their last year at Primary School. He is now 11, and will start next year at college which runs from Yr 7 - Yr13. The men in the family... I'm sure Dylan will get to be as tall as his father one day. We also attended the school Prizegiving, where both Dylan and Nadia won Achievement Awards, which was a nice surprise. I have really felt this year has been quite exhausting, and I am only just now (after almost a whole week off work) feeling like doing much, other than relaxing reading books. I have quilt designs dancing through my head... and a solid list of things that need to be cleaned, which I am slowly psyching myself up to start. ... and started compiling the rest of the components for the other five blocks. In my head this project has progressed from an occasional filler project into something that I would like to get finished. I would also like to get cracking with the Modern Wedding Ring project now that I have all the fabric to continue. So once again - so many projects, so little time. I am almost at that stage where I have so much going on in my head that I don't know what to do next, and consequently do nothing. But I also know that quilting, like many things in life, is a matter of starting, having patience, working diligently, with the knowledge that one day it will be finished. And on that cherry note... time for get lunch started for the bottomless pits that I call children. I am officially well past the point of no return on Imogen's quilt. Although I am rapidly approaching the "this is going to drive me crazy" stage. At the moment I'm concentrating on the applique blocks - spirals and pebbles inside the "somewhat straightish" frame that I quilted freemotion using the quilting ruler I purchased at FOQ. Using the theory of quilting the same motif in the same areas, these triangles that flowed out into the border received the same design. I am going to quilt something different in the area that flows through the stars - but I'm not quite decided yet. You all know I'm talking about Xmas being the storm...don't you? The opportunity to get away for an evening - without children - and spend a few hours participating in a Xmas related mystery project at my favourite patchwork shop (The Country Yard) was too good to pass up (even though, if you are a regular reader, you'll know I'm not a huge Xmas project person, OR all that big on small fiddly projects). As this happened on a Friday night, coinciding with their regular once a month Saturday stitching, meant I scored a bonus get out of jail free card - and stitched away to my hearts content on Saturday too! Bliss. Well, the mystery Xmas project was a felt stocking kit. Blanket stitch, back stitch and french knots are all within my abilities, and while the stockings are smallish - a few chocolates or lollies will fit nicely inside (or a pair of glasses as another participant discovered - and she was going to make one for her husband and I came up with some other suggestions of what he could fit inside, which she ignored but, hey, it was getting late and I was eating chocolate and drinking coffee past my bedtime) - they weren't too small to cause warnings on my "this is too fiddly" antennae. There were spot prizes and a team relay challenge - involving Hershey's kisses and oven gloves, but we won't go there! There may be Facebook pictures - you have been warned. Needless to say, a lot of fun was had by all, and I seriously recommend taking advantage of such activities at your own local shops should you have the chance. and scored a decorated hand towel for travelling the furthest. Of course, no evening would be complete without a small amount of shopping - so I added to my small Xmas stash a new pattern book - some delightful Gail Pan stitcheries and projects. Saturday was my project day, and after much thought and procrastination, I had brought along my feathered stars. I made pretty good progress considering it has been such a long time since I did anything on this that I couldn't remember any of the sizes, and had left my pattern instructions at home. All fitting together so far. I had cast my eye over quite a few odds and ends that desperately needed to come home with me - thread and needles being particularly necessary, the charm pack and fat quarter were just willing add ons, and I bought the rest of the background fabric I need for my modern double wedding ring quilt that has been on hold for several months waiting for this fabric to arrive. I also collected my Viewers Choice package for my Berries and Bluebirds quilt. A runner kit, scissors and thread! Thank you Kerryn for being so generous! My large scissors are well over twenty years old - so I'm well overdue for a new pair. So exciting! I don't know if I would ever make this particular kit - but I have no qualms about adding the fabric into the stash... very useful! OK, the rest of the week has been slowly filled with machine quilting. Remember, I had talked about Imogen's quilt - a group project that I was asked to be the quilter for. The batiks and blocks in this quilt just turned out stunning, so the pressure was on to come up with some quilting designs that did the quilt justice. I decided in the end to frame the applique blocks, using the angle of the stars to form an onpoint square, which cut though the applique in some places. I am using the thread I purchased from the Auckland Festival of Quilts - which is running very nicely through my machine, and while it has quite a sheen on it on the spool - it tones down a bit once quilted, and is looking very nice. Having a built in thread stand on your sewing machine comes in handy for these large cones. That's my life all caught up for the moment - two more weeks of school/work left before Xmas school holidays - hence the need for the calm! After a night and day away, I now feel like I can approach the rest of the crazy season with some level of inner peace - well, that's the theory, and I just need to remind myself (repeatedly) that everything will be fine. For me there is no better place for a quilt than a bed. As Dad came to visit over the weekend, I asked him to send me a photo of his quilt on his bed... so now I can imagine him all snuggled up underneath it. He is loving his new quilt, and appreciated how easy it is to make his bed look nice with minimal effort. While the quilting community is slowly gaining momentum in NZ, it will be some time before quilting in general becomes a household name. 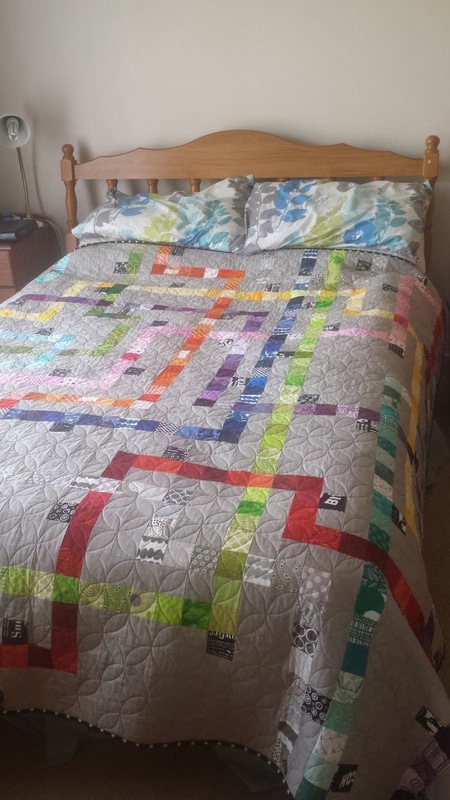 After all, the first quilt I ever saw was the first one I made. What a long way we have all come! Where have the last few weeks disappeared? If I am not regimented and post on a weekend... somehow it ends up being a new week... and sometimes even a new week again. 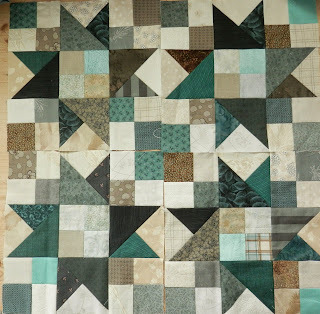 I've been plugging along quilting the Baby Bunting Quilt. I had hoped to have this finished in time to exhibit at the Waimate North Agricultural &Pastoral Show last Saturday (think lambs, cows, horses, produce, floral, hand crafts and baking competitions), but by Wednesday I knew that it wasn't going to happen. So over the last week I finished up the last of the quilting and the scrappy binding - now just the threads to cut, and a little bit of hand applique to tidy off the bit that I missed with the machine. The stipple quilting has made the applique and star points pop - plus provides a lovely all-over texture. I also disappeared off to The Auckland Festival of Quilts with Charlotte and Mathea... a mere three hour one way journey (time for lots of girl talk... and oh, the range of topics discussed!) We walked and walked... looked and looked... and shopped and shopped. I took a series of random photos - mostly to remind me about something in particular rather than showcasing the gorgeous quilts that were on display. I really liked how this double wedding ring quilt included this applique border. I really like this somewhat Hawaiian applique style - stylized pohutukawa pattern. It also had some wonderful quilting. While I'm not usually a fan of diamonds, I did quite like this log cabin like arrangement. And this one also had a great quilting pattern in the background space. It can be hard to fit daisy like flowers together, but filling up with pebbles seems to work well. And I don't think I even took a photo of the rest of this quilt - but was fascinated by the precision quilting... computer aided I am sure. A variation on a disappearing nine patch block. This had a really interesting setting. A nine patch sliced somewhat off centre... very clever! Combining both machine and hand quilting. I still gravitate somewhat towards the low volume backgrounds... also the soft colour variations in the feature areas. This one very cleverly had a graded colour wash of plus shapes - something not noticed until viewed from a distance. Check out Charlotte's blog here for more FOQ (really, do you think this abbreviation will catch on... after all, how would YOU pronounce it?) pictures (of some actual full quilts) plus more links to other blog photos. In the shopping basket I have some new thread to try... plus a new (unphotographed) quilting ruler. And what's a quilt show without some new random fat quarters? Random + Random = a new wee bundle.